The Editor of the New Crusading Guide, Kweku Baako Jnr, is disputing claims that embattled gold dealership firm, Menzgold Ghana Limited, has more than a million customers whose funds are locked up in the controversial minerals trading company. 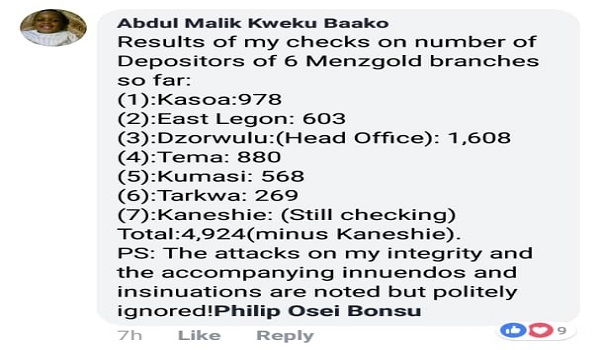 Kweku Baako said his checks showed that Menzgold had a combined 4,924 customers at the branches, with the exception of the Kanashie branch. During Asempa FM’s Ekosii Sen on Tuesday, he sent in a text message saying, the huge figures are obviously exaggerations. His message was later posted on Facebook by the Host of the programme, Philip Osei Bonsu. Menzgold has branches at Kasoa, East Legon, Tema, Dzorwulu, Kumasi, Tarkwa and Kaneshie. Later on Wednesday morning, Mr. Baako gave out an updated information on Philip Osei Bonsu’s Facebook page. He has however independently confirmed the information to citinewsroom.com. Despite agitations and protests from customers of the company over the last few months, the actual number of affected depositors is unknown. A lawyer for some of the customers, Amanda Clinton, without giving an actual figure of customers of Menzgold, said 1.8 million Ghanaians had been affected in the last five years by Menzgold’s operations. She said the 1.8 million figure she cited was gotten from sources within certain government departments. The lawyer also said $200 million is believed to have been locked up in the company. Menzgold was asked to suspend its gold trading operations with the public by the Securities and Exchange Commission (SEC) in September 2018. According to the SEC, Menzgold had been dealing in the purchase and deposit of gold collectables from the public and issuing contracts with guaranteed returns with clients, without a valid license. The company has since been met with some lawsuits by aggrieved customers, while its Chief Executive Officer, Nana Appiah Mensah, has reportedly been under arrest in the United Arab Emirates since December 08, 2018. The Economic and Organized Crime Office (EOCO) has also frozen some accounts of Nana Appiah Mensah. EOCO in the coming days, will be applying for a court order, to freeze all landed properties belonging to the CEO and companies.